This month I was one of the guest contributors over at ALLPM.com where the theme was emotional intelligence for project managers. I contributed the following list of daily tips for project managers and after looking at them, I realized they are pretty good! 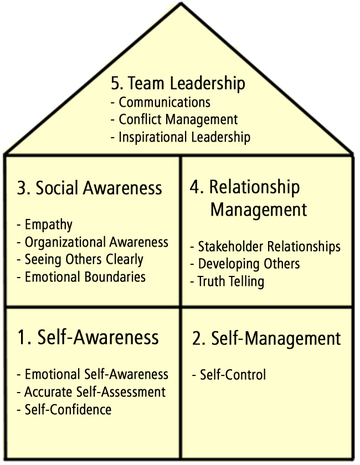 So here are the 20 tips of the day from ALLPM.com, grouped according to the emotional intelligence framework for project managers shown below. Enjoy! Tip of the Day #1 – David Caruso and Peter Salovey said that “emotions are information”. Are you able to fully experience your emotions at work and use them as information? Or do you try to “leave emotions at the door” when you arrive at work? Try logging every emotion you feel throughout the day today. Later tonight, spend some time reflecting on those emotions and see if you can understand the information that each emotion provides. Tip of the Day #5 – Do you recognize when you are experiencing feelings during the day? A simple technique for increasing emotional self-awareness is to track emotions during the day using SASHET, an acronym for Sad, Angry, Scared, Happy, Excited and Tender. Keep a SASHET tally sheet today and see if there are patterns in the emotions you feel and those you don’t feel. Tip of the Day #6 – Sarcasm is usually an indication that someone is both angry and scared. When you hear sarcasm, you should ask yourself what that person is angry and scared about. This is doubly important if you are the one using sarcasm. I challenge you to make note of the times today that you hear sarcasm being used and looked behind the sarcasm to the emotions of the individual. Tip of the Day #7 – Most of us cringe when we hear negative feedback or criticism. Feedback is a gift. Even critical feedback usually contains some kernel of truth that helps us grow if we are open to it. When we hear critical feedback, we need to get over our own defensiveness, listen carefully, and ask probing questions that lead us to that kernel of truth. Our greatest growth opportunities will come from those ‘gifts’ from others. Tip of the Day #10 – Self-confidence is when we are grounded, secure, and self-assured. It’s easy to be rattled or thrown off our game by a recent setback or failure. One technique for overcoming a lack of self-confidence is to reflect on our past successes. Create a timeline on a piece of paper and mark on it the successes, small and large, that you have experienced over your career. By reviewing our past successes, we can put our current setbacks into perspective and see them as temporary. Tip of the Day #3 – There are times when we remain unruffled by others and times when we react strongly. Pay attention to those times when you let other people push your buttons. What are the specific conditions where you are likely to let your guard down? Is it when you are tired, stressed, sick, feeling unappreciated or criticized, or not taking care of yourself? Try to avoid putting yourself in those situations where you aren’t able to choose a graceful response. Tip of the Day #9 – Many of us work in environments that are stressful. We can remain graceful and unruffled when we learn to reduce our own stress level. I have found that laughing out loud, going for a walk, spending time with people I like, breathing techniques, and prayer or meditation help me to unwind. Select one of these techniques and practice it today, even if you don’t really need it. Tip of the Day #11 – Perfectionists find that people never quite measure up to their expectations. They can be just as hard on themselves as well. Instead of going for perfection, strive for excellence which can be defined as doing your very best in every situation. Celebrate excellence and don’t get sucked into thinking that everything needs to be perfect. Tip of the Day #15 – Some of us set ourselves up for stressful situations or negative outcomes by arriving late or unprepared for early morning meetings with team members or other project stakeholders. This can cause us to lose momentum or feel lousy for the rest of the day. Next time you have an important meeting, try getting to bed early, getting up early, and getting in to work before everyone else. Allow yourself some quiet time to review your notes and objectives for the meeting as well as to think about the emotions of each person that will be attending. Your calmness and quiet confidence will show clearly and even be contagious. Tip of the Day #8 – If you want to boost your standings with your project team, learn to listen with empathy. This includes giving others your full attention when they are speaking and letting them speak instead of interrupting or finishing their sentences. When they have expressed themselves, respond with empathy and emotions (e.g. that sounds tough, you sound sad). Finally, ask them what you can do to help. Don’t assume that you have to solve their problems or tell them what to do. Tip of the Day #2 – Project management is about getting work done through others. Rarely is anything of significance done by one person working alone. It is the relationships we build with our team members and other stakeholders that determine how effective we will be as project managers. Take an honest assessment of the most important stakeholder relationships for your current project. Make it a point today to meet with those individuals with the objective of improving your relationship with them. Tip of the Day #4 – Mom always said “If you can’t say something nice, don’t say anything at all”. Unfortunately that approach can lead to a dangerous buildup of hurts over minor and major issues. A better approach is to keep short accounts with people by saying, “I don’t like it when you do/say X”. This frees us up from holding on to resentments and avoids a major explosion down the road. Tip of the Day #12 – Picnicking is a term for people who eat their lunches alone at their desk, ostensibly because of their workload. This is isolating and keeps us out of relationship. Instead of eating alone, make it a point to go to lunch with a co-worker, team member, or a project stakeholder. The relationship you will build will produce benefits far greater than what you would gain by working through lunch at your desk. Tip of the Day #13 – While we all strive to do our best to build relationships, we will invariably find that we don’t always get along with others. If you find yourself consistently having relationship problems, look for patterns of those problems. Since we are the common denominator in our relationships, we may be the cause of the pattern of breakdowns. Some of us unknowingly carry emotional baggage with us. By becoming aware of the pattern, we empower ourselves to do something about it. Tip of the Day #14 – People tend to thrive on positive recognition and acknowledgment and wither on criticism. Since it was always easier for me to point out what was wrong than to recognize what was right, I had to push myself and build routines into my day and week to be more encouraging. One technique I found helpful was to keep a log of when I recognized various team member’s positive contributions. Try keeping a tally sheet of your team and mark down whenever you are able to recognize one of your team members. Strive for at least one positive or encouraging comment per person each day. Tip of the Day #18 – Relationship-building is a task you will rarely find on a project plan or in a WBS. However, as a project manager, building relationships with project stakeholders is a major success factor. Don’t leave stakeholder relationships to chance; give this activity the same importance as other project management tasks. Add relationship building tasks to your ‘to do’ and ‘action item’ lists, block out time on your calendar for relationships, and track your progress in this important area. Tip of the Day #16 – The project manager has the opportunity to establish ground rules, values, or expectations for the behavior of the team. If you don’t set those up at the start of the project, you may be surprised to find that people behave badly and team members don’t respect you as the leader. Try working with your team to create a contract for behavior early in the project lifecycle. This will make everyone a part of the process and accountable for enforcing whatever rules are agreed. Tip of the Day #17 – My mentor Robb used to say that you live or die by your project team. Getting the best resources is critical to your success; this shouldn’t be left up to chance or to the resource managers in your company. You will attract and retain great project resources when you develop your interpersonal skills (like emotional intelligence), lead with integrity, and create a positive project environment. Tip of the Day #19 – Holding others accountable is a key part of the project manager’s job; if you are not doing it you are not leading. I sometimes find it challenging to hold senior managers, clients, or project sponsors accountable because I fear confrontation with them. It has helped me to pinpoint the source of my fear, challenge whether it is valid or not, and then move forward through the fear. It also helps to have a tool like a Responsibility Matrix to clearly communicate who is accountable for project activities. Tip of the Day #20 – As the leader of the team, the project manager sets the emotional tone for the group. Do you emote positive feelings and create what Daniel Goleman calls “resonance”? Or do you tend to give off negative vibes and create “dissonance”? Take time today to ask one or two of your current team members if they experience you as positive and encouraging. Listen as quietly as you can, without defending, and try to note at least one or two things you can do differently to boost your resonance level.